Some say respect should be earned; that it cannot just be given on the mere basis of age and experience. But what do you know about what was, before you even were? Big talk and no walk, has never made mileage, but action, actions speak loudest, still today. Respect breeds respect and guarantees the preservation of values and mores, values that form part of our identity, of our morality, our sense of gratitude, and give us a sense of belonging. The breeding ground for goodness, magnanimity, honesty, truthfulness, character, integrity, and good behaviour lies exactly here. Pagan communities have always been hierarchical structures and Community Elders can be very powerful, revealing the mysteries and traditional treasures, bit by bit to the younger generations, a slow initiation of sorts, into a place of trust where another level of the tradition can be given or divulged to the candidate. Another veil of the Mysteries peeled off the onion, the survival of the Old Ways happened this way. Through the patient initiations of the young by the elderly. Age and grey hairs do not necessarily denoted eldership. They represent senior(ship). Being an elder goes deeper than age and knowing. It is a lifetime of sharing, and of service to the community, of fighting battles and standing up for causes, of caring enough to act, teach, enough to be recognised by the wider community, people who are held in high esteem, generally older people who have earned these titles. Elders don’t have the need to be elders. It is not an ambition of theirs. They are who they are, irrespective of wider acknowledgement or not. They are usually addressed with words such as “Milord”, “Lady” “Milady”, “Sister”, “Brother”, “Ma”, “Tannie”, “Oom” which in this context are terms of respect more so than terms of endearment. They are words used for people who have earned respect and who are looked at for guidance and learning. The young are distracted by entertainment, the media, competition with one another, modernity itself, and the elderly are derided and left to their own devices. Left to rot, in many instances. They are regarded as dry branches, useless, branches that must be pruned off. Sad! If young people don’t have folkways and mores, they really don’t have anything. They do not belong, they are lost, washed adrift by globalisation lost within the multicultural machine. Modern day living, as well as mainstream media, the erosion of communities and responsibilities of community leaders, and the loss of the Old Ways means that fewer people respect elders and lack of respect and lack of support are growing without measure. Lack of respect and support for elders may be growing in society at large, but our culture, the culture inherent in us says quite different. For centuries society has used names like crone, hag, ol’ bag (of bones), biddy, old goat, etc. to put down older men and women. But women and men everywhere have made giant steps to reclaim the power of the experience of old age and the wisdom that it gives one. What do you, young ones have to learn from us “long toothed ones”? I remember my Mum (a widow) and her Sister Sheila discussing their aches and pains, the changes of menopause and how terrible those years were. Being an impressionable young lass, I spent the rest of my life researching menopause and those horrors I wished to avoid. I must say I have greeted my first grey hairs, the symptoms of peri-menopause with excitement and glee. I realised that in those days, my poor Mum’s days, the purpose of a woman’s existence, was that of caring for her man and raising their children. That involved conjugal duties and the ability to procreate. When my brother and I left home and Dad passed on, she wrapped her life’s experience and thinning greying hair around her like a shawl of defeat. Her hour had come and she had lost her place in the world; what a horrid prospect it must have been and today, I understand the conversation, the changes brought on by time, and the way it made me feel. Most of all I understand the valuable lesson it taught me. I am fortunate enough to know and understand that this is my passage to power and not my time of decline and despair. Our Ancestors believed there were three stages in a woman’s life: maiden, mother and crone and today we add to that the knave, the warrior and the sage, to cover also the Male Mysteries. The maiden’s age starts at birth but is formally celebrated at the age of 12, followed by the blood initiation and the onset of puberty, right up to when in the mid-twenties the Mother stage kicks in (regardless of the fact that one bore a child or not) with its nurturing instincts and qualities. This phase lasts until the post menopausal stage, in which a woman ceases to shed “moon blood” (or “wise blood” as it is called by many) and retains the wisdom of the moon, inside her body. This is a stage of enormous power, a stage that integrates the tenderness of maidenhood, the lessons of life, the mothering instincts and care taking qualities, as well as the wealth of one’s life experiences. Call her cauldron woman, midwife, call him shaman, medicine woman or man, call them crone and sage. They work in synch with Mother Nature and cure ailments, they understand and balance the scales between light and dark, between death and life, they are one with wisdom, and wise enough to weigh morality up against legality. They are fit to be entrusted with decision making, for their ability to step out of the personal and consider the collective versus the self, is obvious in their every deed. The female trinity (maiden, mother and Crone) ruled the cycles of destruction/creation/birth. In the Middle Ages, which were predominantly Christian, it was believed that ageing, pain, disease, suffering, were all consequences of Eve (woman’s) disobedience to God. Any woman or man working towards relieving any of these symptoms were working in defiance against the Creator and so the Crones and Sages were silenced, persecuted and executed. The metamorphosis of the Crone, Sage and village Witch thus transformed into that of the terrifying old Bag of Bones. The harmful, baneful person that deserved to be taken to the pyre and executed. Being old, no longer being fully interested in the competitive drives of life, being more prone to understanding than the exercising power over, became viewed as a shortfall by society. Insults became the order of the day and the elderly lost their status and power to help. 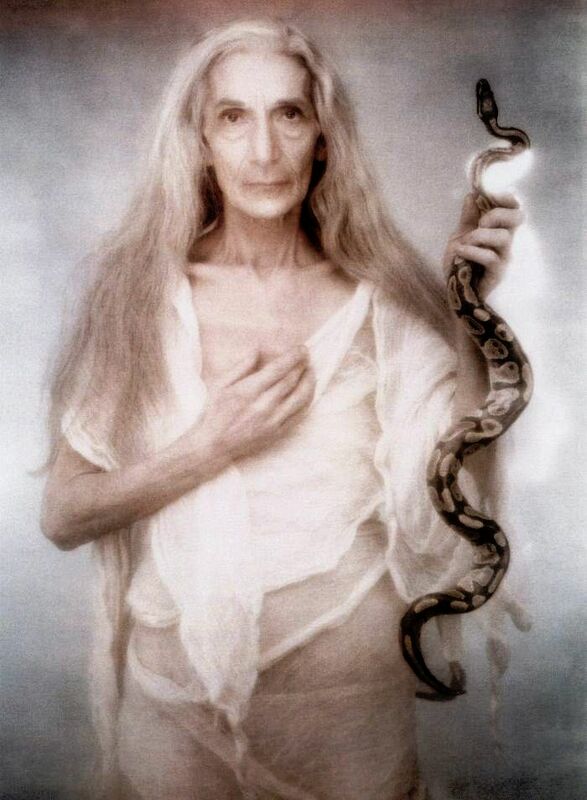 Becoming a Sage or a Crone is about inner developments and not at all linked to outward appearances. Are crones and sages older men and women? Yes, but not all older women and men are are crones and sages. It is a deliberate way of living, the wearing of a badge of honour, and not the hallmark of longevity. The sage and crone are usually over 50. They have made mistakes, plenty of them, they have experienced love, hope, sorrow, loss, fear and have served their own and the whole collective, for the entirety of their lives, taking ownership of their hard-learned lessons coming out of it all with wisdom and confidence. They are Mahatmas, great souls and everyone can see it. They are not reluctant to tell the tales of triumph and even to share their most embarrassing moments in life. They show that they are just as seasoned with flaws as the rest of us. They are capable of being openly cantankerous, patient, caustic, kind, they are living enigmas, mirthful, serious, sad, witty, happy, foolish, and carefree but also organised. They have honed their inconsistencies into sharp implements for community work and nothing and nobody will make them back down. They are authentically relaxed people and comfortable in knowing that too much energy is wasted on questing for the ever-evasive absurdity called perfection, fully accepting life for what it is and what it brings and that everything is perfect in a messed-up way. From them the young can learn that there is no need to conform, but rather find your own self and niche in a world that is constant only in changes. Do what you want to, get what you need and let go of guilt. Do what is right, in the sense of inner knowing what right and wrong are, without becoming burdened with religion, dogma and rules of living that are broken and disrespected by the very same people who make and enforce them. Do not cower, stand up and be counted, voice your mind and remember that silence allows. Less is sometimes more and enough is enough, even when it’s good. I have noticed that older men and women have a whale of time joking about life and its curve balls; the perverse sense of humour comes out of realising that old age does not mean the end of beauty, excitement, sexuality, potency and the ability to do and to live life to the fullest. We are ready for the responsibilities of eldership, counsellorship, teaching, and showing the way. The media shows the young how to be beautiful, ripped, fit, how to have a successful career, how to marry and have children, how to budget, save, build a house, but who empowers us with stories of life experience, with wise tales and practical advice? ‘Tis the old folk! We may be older, pensioners, but we still have an identity and wisdom accumulated throughout the years. We are people of power. See us and honour us and honour too those who came before us, with respect and fireside stories that speak of glory and conquering our own very selves. Conquer ourselves! May you grow to be as old as the hills! And may your young ones sit at your feet and relish in the stories of Old.